Are you missing one or more teeth? Do you have teeth that need to be extracted? Do you currently wear loose, uncomfortable, or ill-fitting dentures? If you answered yes to any of these questions, dental implants could provide you with a fully functioning, natural-looking, permanent solution! Bay City periodontist and implantologist, Dr. Picard, is trained in the placement of dental implants. He wants to help you get the smile you deserve, so you can get back to smiling, talking, and eating with confidence again. Dental implants are the preferred method of doctors and patients alike for replacing missing teeth. 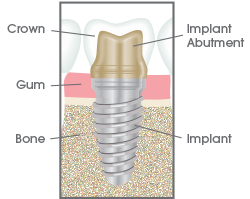 Implants are small titanium posts that are placed into the jawbone where a tooth is missing. The post is a biocompatible material, so it fuses with the bone to create a solid anchor for restorations. 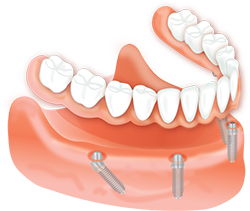 Once the implant has fused, a crown, bridge, or denture is placed on top. The restoration looks, feels, and functions just like your natural teeth, giving you a smile you can feel confident about. Contact us today to schedule your implant consultation. Dental implants not only give your smile a new lease on life; they also provide a number of benefits. Implants are strong and stable replacements for teeth, providing you with a new smile that looks and feels natural. Implants function like your natural teeth, so you can eat your favorite foods. With proper at-home care, dental implants will last for years. Replacing missing teeth with implants helps your mouth, jaw, and face retain their natural shape. Missing teeth can lead to bone loss, but placing dental implants helps protect your healthy bone tissue from further deterioration. For those who are cavity prone (or acquire cavities easily), dental implants are resistant to cavity forming bacteria. Dr. Picard is the leading provider of dental implants in Bay City, MI. Let him help you give your smile a second chance! As a specialty dentist in Bay City, MI, Dr. Picard is also trained in using dental implants to stabilize loose or ill-fitting dentures. To stabilize dentures, implants are placed strategically into the jawbone. The implant posts have a ball on top that snaps into a retaining fixture that is placed on the bottom of your denture. With implants for denture stabilization, there is no more need for messy adhesives or glues to keep your dentures in place. You’ll be able to eat all your favorite foods again in no time! Call Mid-Michigan Periodontics & Dental Implants to learn more! In a sinus augmentation, bone is added to make room for a dental implant. Quite often, donor bone is utilized for this procedure. Donor bone is used after careful screening and cleaning. Gum tissue is cut and raised to expose the bone. The membrane that lines the sinus is gently moved up and away from the jaw, and bone-graft material is placed in the space where the sinus was. The tissue is then closed with stitches and left to heal for 6-9 months, after which time your implants will be placed. Have questions? Learn more by calling our office today!